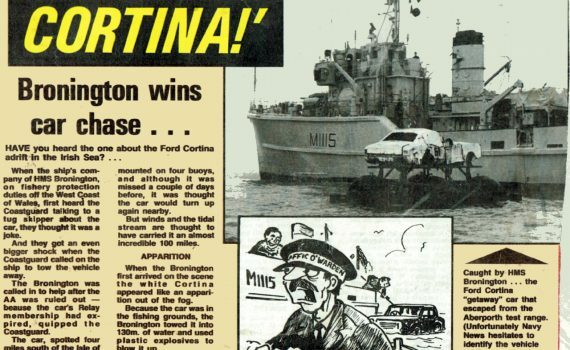 Have you heard the one about the Ford Cortina adrift in the Irish Sea? 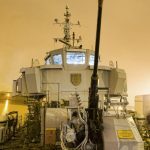 When the ships company of HMS Bronington on fishery protection duties of the West Coast of Wales first heard the Coastguard talking to the skipper about a car, they thought it was a joke. And the got an even bigger shock when the Coastguard called on the ship to tow the vehicle away. The Bronington was called in to help after the AA was rules out – because the car’s Relay membership had expired, quipped the Coastguard. The car, spotted four miles south of the isle of man by a coaster fishing offshore, had traveled over 100 miles from its moorings in Aberporth. It had been intended as a missile target, mounted on four buoys, and although it was missed a couple of days before, it was thought the car would turn up again nearby. But winds and the tidal stream are though to have carried it an almost incredible 100 miles. When the Bronington first arrived on the scene the white Cortina appeared like an apparition out of the fog. Because the car was in the fishing grounds, the Bronington towed it into 130m of water and used plastic explosives to blow it up. Sub-Lieut. Adam Egeland, Bronington’s public relations officer, said it was an unusual task that attracted a lot of attention. But a former shipmate has disclosed that the Prince suffered from such a bad case of seasickness that he captained his vessel with a bucket by his side. Michael Sinker was a chef on board HMS Bronington, which the Prince commanded for nine months in 1976. They met again recently when the Prince hosted a reunion party at Clarence House for his old crew. 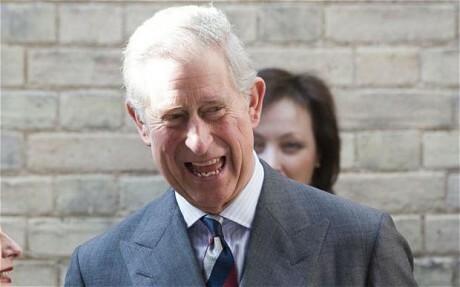 Reminiscing about their days at sea, Mr Sinker, 58, said: “Charles was brilliant. When you got him to sea without his bodyguards he was just like one of the rest of the crew, though he wasn’t a very good sailor and he was seasick, as were a lot of us. If it was rough he would go on the bridge with a bucket! “She was a wooden minesweeper of only 350 tons – at that weight she used to roll, and once we started rolling Prince Charles was sick like the rest of us. We were – excuse the pun – all in the same boat. 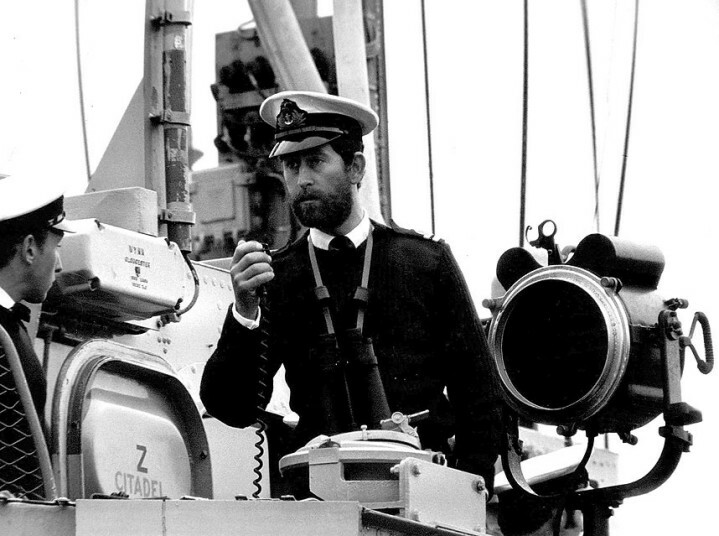 The Prince began his naval career in 1971, completing a course at the Royal Naval College, Dartmouth and following in the footsteps of his father, grandfather and both his great-grandfathers. 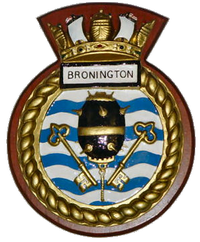 His nine months as commander of HMS Bronington were his last in the Navy. 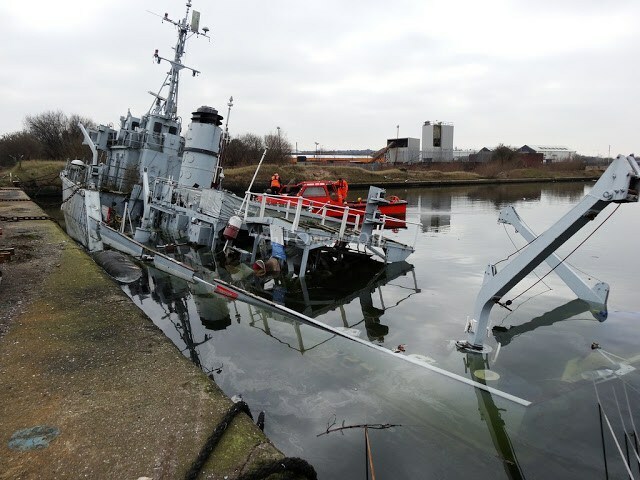 HMS Bronington was then based at Rosyth, Fife, but is now rotting in Vittoria Dock, Birkenhead. Mr Sinker’s wife, Marion, was instrumental in organising the reunion after she came across a video of the ship on YouTube. “My wife and I met when I was on the ship, we started out as penfriends and have been married now for 33 years. So when she saw the state of the Bronington she cried her eyes out,” Mr Sinker said. Mr Sinker tracked down many of his former crew mates via the Forces Reunited website and Navy News, and around 30 people attended the Clarence House reception on February 24. Mr Sinker, from Sidford, Devon, also recalled that he and the Prince had a beard-growing contest while on board the Bronington, which the Prince won. The Prince was so delighted to be back in the company of his former crew that he reportedly took them for a drink at a pub close to Clarence House when the reception ended. He also presented each man with an embossed wallet as a gift. BRONINGTON has sunk at her berth in Vittoria Basin, Birkenhead. She was discovered semi-submerged on the morning of Friday 18th March. Subsequently there has been considerable ill-informed speculation on social media about the cause of the sinking and a further “rescue” attempt. TCA was last on board the ship in 2012/2013 when, with the cooperation of Peel Ports, we recovered several items of her minesweeping equipment. These are now on public display at Marshland Maritime Museum, Clenchwarton, near Kings Lynn, where owner and TCA member Mike Smith has kindly allowed us to build up a gallery of TON-Class memorabilia. TON Talk Edition 156 of June 2012 described the parlous state of affairs we found aboard the hulk – for that is what she had been reduced to by vandals and a raid by a consortium of museums that had not consulted TCA about the artefacts we had placed aboard BRONINGTON. She was beyond economic repair, with everything of value, financial and sentimental, stripped from her, with bridge, cabins and messdecks trashed. At that time we raised serious concerns about her structure and watertight integrity of her hull. In the early and mid-1980’s senior members of TCA attended meetings where interested parties got together to examine the possibility that a representative TON could be preserved as a museum ship. The discussions encountered many difficulties, not least of which was finance, and the end result was to bring BRONINGTON to Manchester but with funding for only a limited period. 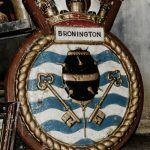 TCA has never had any financial or legal interest in BRONINGTON, but we have strong emotional links with her and visited the ship regularly when she was open to the public in Manchester and Birkenhead. We have endeavoured to maintain working relationships with all parties who have owned/controlled the ship since she was bought out of the RN in 1989. As well as adding equipment and memorabilia to her inventory, TCA has also worked with BRONINGTON’s owners on maintenance and preservation of the ship, including making grants for materials for repair work. TCA does not wish to engage in the speculation following the sinking. Instead we have concentrated on our dialogue with Peel Ports, owners of Vittoria basin and, de facto, responsible for BRONINGTON. Peel Ports have been in discussion with the Environment Agency for some time about appropriate methods for “de-construction of the ship in situ” i.e. breaking her up where she lay. Some time ago we advised Peel Ports on the method and agencies adopted to dispose of KELLINGTON in Stockton on Tees in similar circumstances. TCA hopes soon to be able to advise, with regret, that Peel Ports has commenced the scrapping of this iconic vessel.